IRON MAIDEN Statue / Sculpture "Powerslave Pharaon". 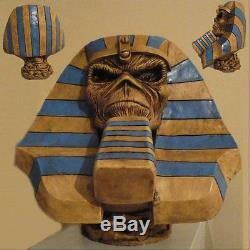 This is an Iron Maiden bust from "Powerslave" album cover, displaying Eddie's head as pharaoh. Eyes have red lightbulbs that can be light up with 2 AA batteries (not included). It's made of resine and measures are 11"H x 10"W x 8D approx. THANK YOU and GOOD LUCK! Don't forget to check my other auctions! The item "IRON MAIDEN Powerslave Eddie Pharaoh STATUE BUST BIG HEAD SCULPTURE CD LP" is in sale since Saturday, April 21, 2018. This item is in the category "Entertainment Memorabilia\Music Memorabilia\Rock & Pop\Artists I\Iron Maiden\Other Iron Maiden Memorabilia". The seller is "cawi32" and is located in Lima, Lima.